This is a reasonably inexpensive bagless Hoover upright with most of the bells and whistles. It is also viewed favorably by some consumers and is a recommended model by Consumer Reports Magazine. 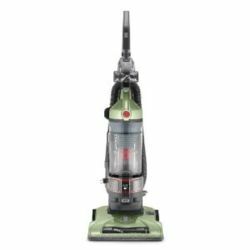 It doesn't have the long warranty of those vacuums in the Hoover Platinum Series, but the two-years parts and labor warranty is still better than some of the other machines in this price range. It has a rinse clean filter that can be removed, manually cleaned and replaced, as well as a lifetime HEPA filter. HEPA filters are a good idea if you suffer from allergies or asthma. HEPA filters remove 99.97% of all airborne particulates of 0.3 microns or larger from the air that passes through them. The nozzle path on the Hoover UH70120 WindTunnel is 13.5 inches  neither particularly wide nor too narrow. It also comes with a 27 foot retractable power cord. Many consumers have indicated they like the retractable cord feature (which is activated via a small foot pedal). 27 feet is perhaps a little short and 30+ feet would have been better. The unit also has 5 different height adjustments  these help accommodate different surfaces. It has a motorized brushroll but there is no brushroll on/off switch. It is sometimes helpful to be able to turn the brushroll off when vacuuming hardwood floors (some brushrolls can scratch certain hardwood floors) or harm delicate rugs. This vacuum does provide for easy brushroll access however. Brushrolls sometime need to be cleaned as material can get tangled in them. There are two levers that can be flipped allowing full access to the brushroll and also making belt changes much easier. The UH70120 is bagless and as such uses a "dirt container" that is filled, emptied and re-used. Many people like bagless machines but there are also many folks who swear bagged vacuums are the way to go. This debate will continue but at this time it appears to be mostly a matter of personal preference. The dimensions of the UH70120 are 12 x 16 x 44" and it weighs 16.5 lbs. It comes with a 2-year limited warranty. Consumer ratings compiled from several quality sources are shown in the table below. They indicate a reasonable level of satisfaction with the machine especially given its low price point. It is also interesting to note the huge number of ratings for the Hoover UH70120. We found over 10,000. This is quite a well known and popular vacuum.